From my early career as a therapist to my time now as an author and leadership expert, I’ve been helping people learn about the power and happiness that come with adopting a mindset of accountability. Counterintuitively, to teach this mindset, I first teach its opposite: learned helplessness. Why? When people believe they can’t have any impact on their circumstances, it keeps them from stepping into the power they already have to create happiness and success. Take me and my desire to lose weight, for example. After a few months of seemingly doing whatever I could to make the numbers on the scale budge, I was seeing little result. In fact, I started wholeheartedly believing I had a thyroid problem. When I went to my doctor, he ran a series of tests and shared with me the great news: My thyroid was perfectly healthy — a bit overactive, actually! He was thrilled, but I was devastated. You see, the reality is that I had told myself a story in which I had done everything I could to lose weight. As my doctor helped me accurately account for my habits, I realized the truth was that I was only making half-hearted attempts. I was consistently dieting from morning until afternoon. After 3 p.m., though, I wasn’t so accountable to my goal. Still, I wanted to attribute my lack of success to a medical problem. A lot of us live our lives the same way. We cite external reasons for why we can’t succeed and believe our own stories that our half-hearted attempts to get results were real. Learned helplessness falsely convinces us that external circumstances hold us back from success, that everyone or everything else is at fault, and most importantly, that there’s no way to overcome this problem. In business environments, learned helplessness is related to team engagement. If employees see their circumstances through their egos, they can’t see any way to make an impact. I’m not talking about healthy self-confidence. I’m talking about the ego that works like a pair of glasses with the wrong prescription. It skews reality and causes teams to move away from the actual facts of a situation by assigning motives, making assumptions, and overwriting reality with mental stories. This ego puts you in the role of the victim, giving someone or something else all the power. Over time, this habit of thought calcifies into a set of powerless and helpless behaviors — a cycle in which people hold themselves back more effectively than any external circumstance or person ever could. When people believe they don’t have an impact, they disengage. One symptom of learned helplessness is battle fatigue, that moment when you encounter yet another obstacle and think, “This issue just never goes away and there is really nothing I can do about it. I just need to learn to live with it.” Humans may not be rational, but they are predictable. People will take a limitation from the external environment, internalize it, exaggerate it, and bolster it in their imaginations until they’ve shackled themselves. They tell themselves a story about what’s possible and impossible, and that story dictates their effort. 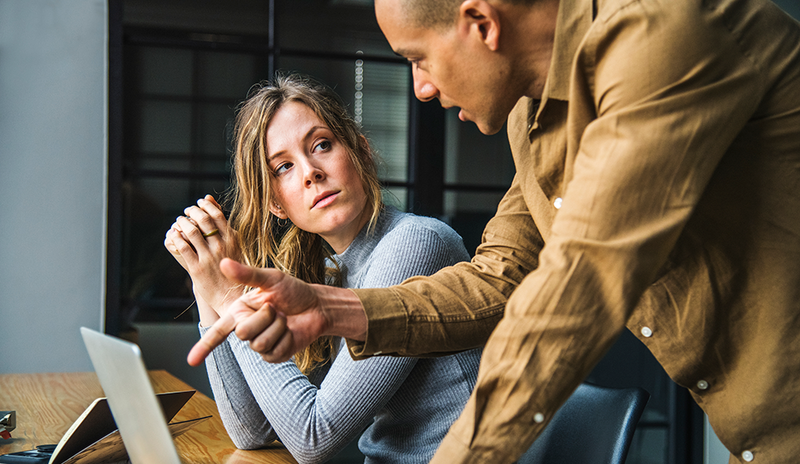 For some time, the conventional leadership wisdom has been that we need to listen idly to the complaints of unhappy employees, that leaders need to work on providing employees with optimal working circumstances so they feel empowered and engaged. This conventional wisdom has led leaders to cultivate entitled workforces, not accountable ones. Accountability is what actually leads to engagement. If you encourage people to cite their circumstances as the reasons they can’t succeed and make excuses for their lack of results, you encourage learned helplessness and the victim mentality that goes with it. You allow people to believe they cannot do their best work in sub-optimal circumstances and that they are not 100-percent personally responsible for their results. In the reality of daily work, teams operate with imperfect plans, imperfect clients, and insufficient resources. Our roles as leaders is to help them step into the power they already have, which is using their skills, talents, and abilities to fill the gaps that exist between reality and perfect circumstances. If someone comes to you in a state of learned helplessness, seeing only lack and impossibility, the best action you can take is to interrupt their thinking and help them get to the bottom of the story. It is the role of the modern leader to encourage a new mindset — that the stories we tell ourselves are the sources of most of our suffering and any stressful thought we have is most likely untrue. 1. What Do We Know for Sure? 2. What Would Greatness Look Like? One of my favorite questions to stop venting in its tracks is, “What would greatness look like right now [for the client, your team, your project]?” This encourages employees to stop thinking as victims and to start generating an empowering and accountable action plan. People can usually answer this question because everyone knows what greatness looks like; it’s the basis on which we judge others. For example, when your morning coffee line isn’t moving fast enough to make it to work on time, we can always describe what a great experience would look like (e.g., more barista help, more registers, a better process, etc.). These questions work because they spur self-reflection, which helps people move beyond the skewed filter of ego. Self-reflection is the foundation of personal accountability. As leaders, we can eradicate learned helplessness by waking up those who have fallen asleep to the story of the ego. Instead of seeking to perfect your team’s circumstances, teach them to live skillfully in any reality. Imagine the power your team will have when they develop the skills to succeed in spite of any circumstances that come their way. Cy Wakeman is a national keynote speaker, business consultant, New York Times best-selling author, blogger, and trainer who has spent more than 20 years cultivating a revolutionary, reality-based approach to leadership. For more on Cy, check out RealityBasedLeadership.com or follow her on Facebook, Twitter, LinkedIn, and Instagram.